The Southwest Airlines Rapid Rewards Premier Credit Card is an excellent choice for all travelers. It doesn’t charge you a foreign transaction fee so whether you are shopping locally or internationally, the Southwest Airlines Rapid Rewards Premier Card won’t charge you for using their card. If you want to accrue Southwest Reward Points for every purchase you make, this card is one that you should absolutely consider. Southwest Rapid Rewards are great because they don’t expire like other airline loyalty points. That means that you can use them when it is convenient for you to travel. Another reason why Southwest Rewards are so valuable is that they don’t have blackout dates. You can plan your business trips or family vacations whenever you want. If a seat is available to purchase, you can also choose to redeem your Rapid Rewards for it. You can build your balance easily when you use the Southwest Airlines Rapid Rewards Premier Credit Card because you will receive 2 points for every dollar that you spend at Southwest and select Hotel and Car Rental Partners. You don’t have to only make travel related purchases in order to accrue points because the Southwest Airlines Rapid Rewards Premier Card also awards one Rapid Reward Point for all other purchases. The card does charge you an annual fee, but when you take into consideration all of the rewards you receive, it is an annual fee that is worth paying. The Southwest Airlines Rapid Rewards Premier Credit Card is perfect for those who have a good credit score. It is not an ideal card for people who are just starting out, or looking to build their credit. 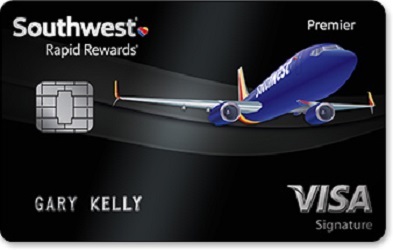 However, The Southwest Airlines Rapid Rewards Premier Credit Card would be a good choice for somebody who would like to save money on high interest rates by transferring a balance from another card that charges higher interest because it is offering a low introductory APR for balance transfers and purchases made within the first couple of months. Earn 2 Points per $1 spent at Southwest Airlines® and Rapid Rewards® Hotel and Car Rental Partner purchases. Earn 1 Point per $1 for all other purchases. No blackout days or seat restrictions when you redeem reward points. Earn 50,000 points once you spend $2000 on purchases within the first 3 months of account opening. This is a card that any traveler should consider. Chase is currently offering a sign-up bonus of 50,000 Rapid Rewards after you spend $2,000 in the first three months and pay the $99 annual fee. On top of that, you will be awarded 2 Rapid Reward points per dollar spent at Southwest Airlines and 1 point per dollar on all other purchases. As soon as I discovered the benefits that this card offers, I immediately applied and was instantly approved within minutes. Chase makes it easy to fill out an application online. It was quick and painless. I had some large purchases to make in my first two months of having the card and shifted all my everyday spending (groceries, gas, dry cleaning etc.) to the card, it was easy to hit the minimum spend requirements, and I had no problem paying the annual fee considering how far 50,000 Rapid Rewards would take me. Rapid Rewards is a great airline rewards program. They don’t have a fixed price for award tickets like some of the other major airlines, that’s great for bargain shoppers. If you are flexible than your Rapid Reward points can go quite far. I live in the Miami metro area and had my eye on a little adventure so I redeemed my Rapid Reward points for a round-trip ticket from Ft. Lauderdale to San Jose, Costa Rica. The best part was that it was only about 25,000 Rapid Reward points so I could take my husband with me. 2 roundtrip tickets from the US to Central America is quite a generous offer for the $99 annual fee. Another Positive is how easy it is to communicate with Chase when I have a question about my account. I could easily call the 1-800 number on the back of my card, but sometimes it isn’t convenient to talk on the phone. Chase has a secure message feature on their website that allows you to message a representative with any question and they answer back very quickly. For me it was less than 24 hours. Although this card has some great benefits, it’s not for everybody. You do need a good credit score in order to be approved, so it’s not really a great starter card. The APR is also quite high so if you do not pay off your balance in full every month, you might be paying for those airplane tickets in interest. Also, the annual fee is worth paying only if you are a frequent traveler who can use the Rapid Rewards, it’s not as flexible as a cash back card. In short, this card is great for me because I love to travel, have established good credit, and always pay my balance in full. If this sounds like you then do not hesitate to apply.